The march toward greater safety with in-car navigation systems takes a step forward every day. And 2017's newest advancement in improving hands-free, distraction-less driving is not only awesome, but super-futuristic as well. 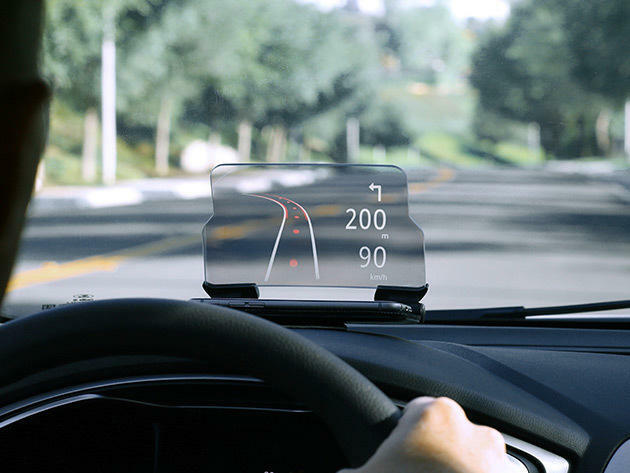 The HUDWAY Glass Heads-Up Navigation Display is available now for only $49.95 in the TechnoBuffalo Deals Store. Unlike those other garish mounts clamped to your smartphone and smack in your eyeline, the HUDWAY looks like a sleek, L-shaped pane of glass. Just place your device on the HUDWAY platform, and the contents of your screen will reflect onto the vertical part of the display…providing a clear readout of your favorite HUD navigation app, including directions, your speed, and other vital stats. While it effortlessly cuts down on driving distractions, it also improves of your phone's display. You'll have a 20% larger image to follow while keeping your attention where it needs to be — on the road. Put one of those trippy 21st century "Minority Report" displays right on your dash with the HUDWAY Glass Heads-Up Navigation Display, which you can get at just $49.95 for a limited time only.